Longtime Brazoria County resident, rancher, developer, Realtor and insurance agent D. Ray Alford passed away on Wednesday [August 16] night at his home in Sweeny after a courageous battle with cancer. To any stranger, D. Ray always offered a strong handshake, introducing himself as a WWII veteran and Aggie Class of ‘45. D. Ray fiercely loved his God, his family, his country and his work as an elder at the Church of Christ in Sweeny. Born in Gonzales County in 1924, D. Ray served as County Extension Agent, a board member of the Sweeny Community Hospital, the Lion’s Club, the American Legion and the Sweeny Chamber of Commerce. He is preceded in death by his parents, J.I. and Mary Gilmore Alford of Waelder; and infant daughter, Dawn Alford. 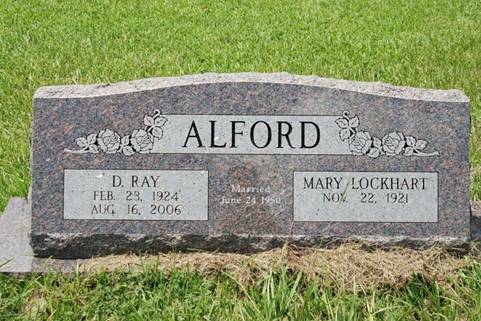 He is survived by his loving wife of 56 years, Mary Lockhart Alford; his brother, James Posey Alford [AAFA #0021] and wife, Mary Elliott Alford of Gonzales. Children surviving are Judy Indest and her husband, Jim, of Pearland, David Alford and his wife, Jan, of Cedar Lane, Susan Salyer and her husband, Glenn, of Sweeny, Sally Lynch and her husband, Robert, of Sweeny and Jim Alford and his wife, Susie, of Sweeny. Funeral services will be held on Saturday, August 19, 2006, at 2:00 p.m. at the Church of Christ in Sweeny at Fifth and Elm streets.... Burial will be in Sweeny. Pallbearers will be Ty Alford, Lang Alford, Chad Salyer, Michael Lynch, Ryan Zimmerman, Jim Indest and Everett Alford. 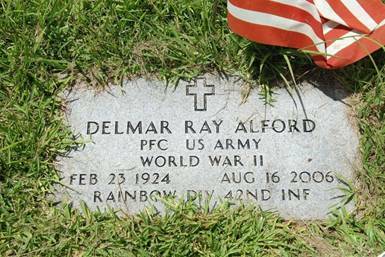 AAFA NOTES: SSDI records show that Delmar R. Alford (SS# issued in TX) was born 23 Feb 1924, but that he died 17 Aug 2006, last residence Sweeny, Brazoria Co., TX. We included the obituary of his son David Ray Alford in Texas Obituaries. He was called Delma for most of his life until a check of his birth certificate revealed his true name. He then became D-Ray to his friends and family. Delmar attended public schools in Waelder graduating in 1941. In September he enrolled at Texas A&M majoring in animal husbandry. The bombing of Pearl Harbor on December 7, 1941, and U.S. entry into World War II would sidetrack his college career. In March of 1943, A&M sophomores and juniors were loaded on to trains, courtesy of Uncle Sam. The Aggie band played as they pulled out of the station on their way to induction into the Army at Camp Wolter, Mineral Springs, Texas. After several days of physical examinations and inoculations, the young men were returned to College Station to finish the semester at the Army’s expense. At the end of the school year, they were sent to various Army bases around the country. Delmar was shipped overseas in 1944 as part of Task Force Linden to Marseille, France where he was issued an A-1 jeep and hustled off to the front on Christmas Eve. Christmas Day found him eating his lunch on the Maginot Line near Strasbourg on the Rhine River. He then became the driver for the company commander, Lester H. Lumus (Aggie class 0f ‘39) and also hauled food and ammunition. After the war ended, Delmar was discharged from the Army in 1946 after being awarded the World War II Victory Ribbon, the Good Conduct Medal, the American Theater Ribbon, the EAME Theater Ribbon, and two Bronze Stars. He returned to Texas A&M, graduated in 1948 with his degree in animal husbandry, and went to work for the Texas Extension Service as a county agent. This eventually took him to three counties: Brown, Fisher, and Wilson through 1955. From 1955 to 1975 he worked as a ranch foreman near Sweeney, Texas. After leaving that position he became self-employed engaging in ranching, real estate development, and life insurance. 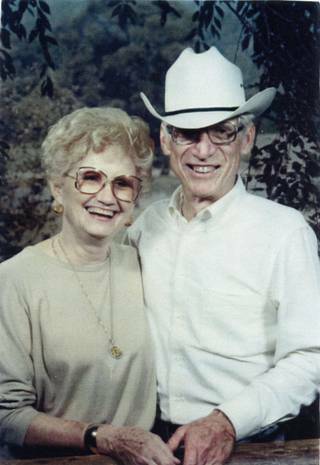 On June 24, 1950 Delmar married Mary Helen Lockhart McSpadden. Mary was a war widow. Her husband, Joe McSpadden, was a B-29 pilot who was shot down May 5, 1945 and was assassinated by the Japanese on the last day of World War II. Joe and Mary had a daughter, Judy Carolyn McSpadden, born March 22, 1945. Delmar and Mary’s children are David Ray (December 25, 1951), Mary Susan Salyer (May 22, 1954), Sally Jane Lynch (August 7, 1957), and James William (January 31, 1963). An active part of the community, Delmar served as a deacon in the Church of Christ for five years and has been an elder since 1985. During the Vietnam War, he served as commander of American Legion Post 463. He is a lifelong member of V.F.W. Post 8551 and has also served as president of the Sweeny Chamber of Commerce (1970-71). As his hobbies and interests, Delmar includes “work, work, work” and fishing and hunting. His lineage: Delmar Ray 1924 TX1, James Isaac 1887 TX2, John Posey 1854 TX3, Hatch 1815 NC4, Isaac 1782 NC5, John 1747 NC6, Julius 1717 VA7, James 1687 VA8, John 1645 VA9.